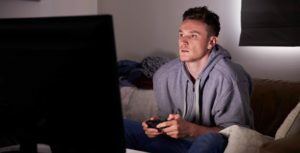 Although the “official” diagnosis of gaming disorder remains controversial, addiction-like behaviors with computer, video, and internet gaming have noticeably increased among both teenagers and adults. Anecdotal reports emerging from doctor’s offices and addiction centers up and down the country have caused significant alarm. Nevertheless, the issue of gaming addiction, and even the pairing of these two words into a recognizable disorder at all, remains divisive. So is video game addiction a real issue, or simply another example of our moral panic being neatly let loose on another target? So what is Gaming Disorder? Critics of the so-called pathologization of video game use argue, among other things, that the harms caused by excessive video gaming are lesser than other recognized addictions by a magnitude of degrees. Supposing drugs and alcohol have the potential to wreck lives, then what harm is a few hours spent in front of the computer or TV at night? Although valid, these arguments fundamentally misunderstand the points put forward by advocates for those suffering from gaming disorder. Responsible organizations should not and do not frame all gaming as problematic. Hundreds of millions of individuals, young and old, enjoy gaming in moderation. In fact, while gaming disorder is an emerging diagnosis and so estimates of prevelance still vary, as few as 1.4% of all gamers worldwide suffer from true gaming addiction (1). Accepting that the severity of one addiction may be greater than another shouldn’t lead us to trivialize what we perceive to be the “lesser”. Respectable institutions carry out studies and surveys designed to gauge the relative harm of different drugs in relation to each other. However, we don’t interpret this as evidence that addictions to supposedly less harmful substances should be ignored and belittled (2). In a nutshell, video game addiction refers to compulsive gaming behavior that continues despite serious detrimental effects on the individual’s physical, mental, or social wellbeing. Compulsive gaming may emerge for a variety of reasons, many of which are not yet fully understood. It does appear that affected individuals are significantly more likely than the general population to suffer from underlying depression, anxiety, or ADHD (3). Excessive gaming generally does not appear overnight, either. Escalating video game use often occurs as individuals become further engrossed in the escape offered by their new digital reality. Gamers may also seek out longer and more intense gaming experiences in order to feel the same excitement or pleasure as when they first began. This may develop as individuals develop tolerance to the “rush” of competing (4). Many parents concerned about gaming disorder report observing aggression, rage, hyperactivity, restlessness, and irritability in their children, along with other behavioral problems. Signs of problematic gaming in adults may be more subtle but are known to include social withdrawal, insomnia, and neglecting other purposeful activities. Someone who is addicted to computer, video, or internet gaming often exhibits an unusual preoccupation with the game or computer when he/she is away from it. The teen could seem distracted, irritable, or disinterested and may talk about the game almost constantly. It’s common for someone with addictive, computer-related behaviors to downplay the amount of time he/she spends in front of the TV or computer. The person may make excuses, saying she “needs” to be online, or may outright lie. A person who is addicted, or at risk of becoming addicted to gaming, is unable to control the amount of time she spends on the computer. He/She may go online with the intent to spend 15 or 20 minutes but will keep extending the time until several hours have passed. Along the same lines, a person may sit down at his computer, again with the intent to spend only a few minutes, but completely lose track of time and suddenly find that several hours have passed. It is not unusual for someone with a gaming addiction to play through the night and only realize how much time has passed when the sun begins to rise. Because the person spends so much time on the computer or video game console, other areas of life are neglected. He/She may grow distant from friends and family who had previously been close. Homework may go unfinished, causing grades to slip. In more extreme cases, the teen may even neglect personal hygiene, choosing to play video games rather than taking a shower. Some people become addicted to gaming because they use it to self-medicate. When confronted with situations or feelings that are uncomfortable (feeling sad, arguing with a friend, or getting a bad grade), the person may “hide” in the game as a method of avoidance. When confronted or asked about his time spent gaming, a person may become defensive. Denial is often an indication that something is wrong, especially if the person seems unconcerned that friends and family feel neglected or left out of his life. Someone who is addicted to video, computer, or internet gaming will spend a disproportionate amount of money on computer-related items. The person will seem to be continually upgrading hardware, software packages, and accessories. This becomes an even greater problem if the person spends money that should be used for bills, groceries, and other necessities. As with any addiction, use of the “substance” – in this case, the video game – initially causes euphoric feelings, but that euphoria is quickly followed by guilt. Guilt may be felt either over what the person is doing while online or simply the amount of time he is spending at the computer. Though this list is not exhaustive, it provides warning signs for parents, friends, and other family members to look for if they are concerned about someone’s use of video, computer, or internet games. This list can also be used as a self-diagnosis tool for those who believe they may have a problem. While the body of evidence supporting the notion of video game addiction has accumulated over the years, the lack of an official diagnosis has troubled campaigners and health professionals alike. Therefore, the decision by the World Health Organization to include gaming disorder in the International Classification of Diseases (ICD-11) marked a highly significant breakthrough. The decision, which is based on ongoing reviews of evidence and a consensus of experts, marks a big step in offering legitimacy to a disorder that has silently impacted millions of lives. Indeed, around 70% of Americans (over 200 million people) now enjoy video games in one form or another. These people range from the most casual smartphone gamers up to those with the most sophisticated consoles and specialist computing technology. While researchers have offered different estimates of the prevelance of gaming disorder, we must remember that even 1-2% out of a pool of hundreds of millions of gamers worldwide still represents millions of negatively affected lives. Getting individuals into treatment for their problematic gaming may also help them to address underlying issues with depression and anxiety, if indeed they are apparent. Using evidence-based treatment to tackle the problem as early as possible is vital if the person is going to recover and reclaim their life.